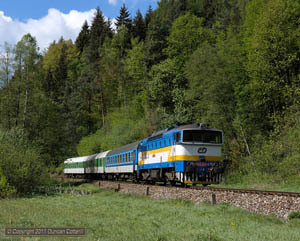 More catching up, this time pictures from the superb Ceske Budejovice - Nove Udoli line in the Sumava in May 2012. Although the Class 749 "Grumpies" were supposed to have been replaced by Class 754s for the 2012 season, they still handled around half the traffic at the time of my visit. it was time to try and fill some of the gaps in my electric coverage. 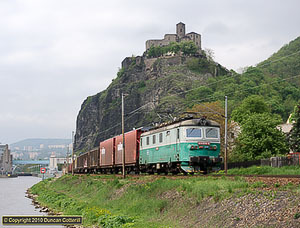 Usti nad Labem is a busy centre for freight and passenger traffic, with a good variety of loco classes and types of traffic and some excellent photo locations nearby. I spent four days there, from 13 to 16 May 2010, but my plans were scuppered by the weather and I spent most of the time exploring. As a result, this report is more of a description of the lines ridden than of the photographic locations visited. It had been a whole year since my last visit to the Czech Republic and, as usual, quite a few operations had changed in the meantime, not all for the worse either. This trip combined some of the new opportunities, both diesel and electric, with return visits to a few old favourites and filling in some gaps in my photographic coverage. The remaining pictures from my April 2008 Czech trip have been added to the photo galleries. 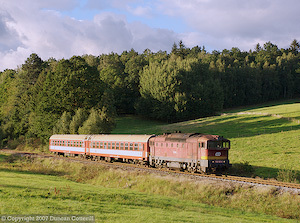 These cover diesel worked lines in the north of the country, notably Sumperk - Jesenik, Jaromer - Trutnov and Liberec - Zawidow. These pictures are from the first part of my April 2008 Czech trip and include new galleries covering the Ostrava - Valasske Mezirici and Olomouc - Sumperk lines as well as additions to the Brno - Jihlava, Zdar nad Sazavou - Tisnov and Brno - Veseli nad Moravou galleries. Pictures from the other lines visited will be added later. 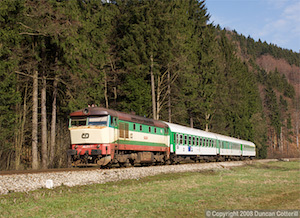 The Hanusovice – Jesenik line in Northern Moravia is a gem of a railway running over the hills just south of the Czech / Polish border. As well as the excellent scenery there are several loco hauled passengers, regular visits by a couple of classes of vintage railcar and one of the most spectacular diesel freight operations it has been my privilege to witness for a long time. Praha is the hub of the Czech rail system and sees a variety of classes working heavy freight and passenger traffic on the electrified main lines radiating from the city. A few less heavily trafficked lines are still diesel worked and see some loco haulage. The capital's main station, Hlavni Nadrazi boasts an impressive overall roof and there are pleasant photographic locations on a number of lines in the greater Praha area. This report describes a photographic trip to the city in late June 2006. This report covers a short trip to Ceska Trebova from 07 to 11 June 2006. 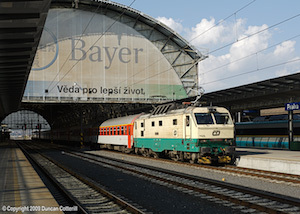 This is one of the Czech Republic's major rail centres, located at the junction of the electrified main lines from Praha (Prague) to the major cities of Brno and Ostrava. It has marshalling yards, a large shed, a locomotive works and plenty of passenger and freight trains worked by a wide variety of electric locomotives. The most scenic sections of the Praha - Ostrava main line lie either side of Ceska Trebova, making it a natural target for the photographer. However, my recent trips there have all suffered from poor weather and two have been notable for not producing a single decent photograph. Fortunately this time was different and there were some good sunny breaks as well as long cloudy periods. The Hanusovice - Jesenik line had been on my to-do list for some time and two weeks holiday at the end of April finally provided a suitable opportunity for a visit. This line features class 749 and 751 diesels and old railcars of classes 831 and 851. The middle of the trip was spent avoiding the rain in Ceska Trebova by travelling around and photographing the loco hauled passengers and heavy freights on the Letohrad - Lichkov line. 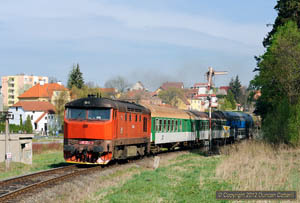 This report describes a week long trip to photograph Czech diesels and electrics around Ceska Trebova in January 2006. This was my first real winter trip to the Czech Republic and I wasn’t really sure what to expect in terms of weather. After a few days of overcast and not particularly cold weather the skies cleared and the temperatures plummeted to below -20°C. The last three days were excellent for photography with snow and sunshine. 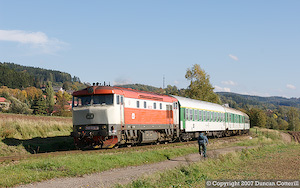 Where do you go in the Czech Republic to photograph heavy diesel hauled freights these days? If you don't want to photograph under the wires and aren't that keen on pairs of 742s coupled cab to cab, there aren't that many lines to choose from. I decided to concentrate on two routes leading to the Polish border; Letohrad - Lichkov - Miedzylesie and Turnov - Liberec - Frydlant - Zawidow as both had reasonable levels of traffic, interesting locos and ran through pleasant scenery with good photographic possibilities. The secondary main line from Brno to Jihlava has long been one of my favourite Czech lines and a return visit was becoming overdue. 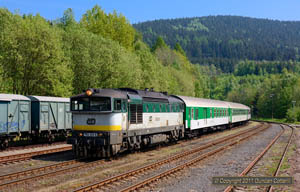 The combination of a bit of freight, an eclectic mix of class 754 and class 742 diesels and vintage class 850 railcars on passenger trains and pleasant rural scenery make this one of the country’s most attractive lines for photography. Previous trips had been dogged by poor or indifferent weather but this time the sun shone solidly for 3 days in a row, going some way to make up for the disappointment of my recent visit to a soggy Ceska Trebova. This should have been a photographic trip but turned into an opportunity to explore a number of lines looking for photo positions to use in the future. To say it rained from the moment I got off the plane to the moment I left would be an exaggeration, but not a big one. There were a couple of very short breaks in the cloud but the sky remained resolutely overcast virtually the whole time and the rain fell continuously for hours on end. Midsummer is a difficult time for photography. The sun gets far too high in the middle of the day for really satisfactory pictures and is at its best very early morning and in the late afternoon and early evening. To make the most of the photographic opportunities you need to find a north - south line with heavy traffic early and late. 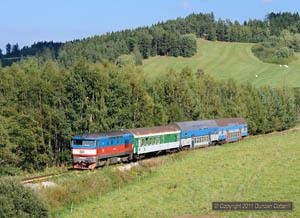 The Plzen – Domazlice line was an ideal candidate with a very sparse midday service but more trains in the rush hours, many hauled by Plzen's photogenic blue, white and yellow class 754 diesels. Report from a very wet weekend trip to Praha. In between the downpours there were a few sunny breaks and a surprising number of photos, especially around Hlavni Nadrazi with it's superb overall roof. There are quite a few interesting workings around Praha at weekends including 749s on most Cercany trains and a smattering of 141 turns, including some expresses, not to mention all the other loco hauled trains with classes 150, 151, 162, 163, 350, 362, 363, 371 etc. 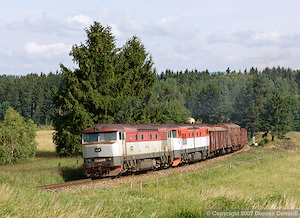 The last concentration of class 753 diesels is at Liberec, where they work freights on the Nymburk - Mlada Boleslav - Turnov - Liberec - Frydlant v C - Zawidow route. I'd had little luck photographing these trains in the past but had managed to get a couple of decent shots on the previous trip. That left me eager for more, so it was back to Liberec at the first opportunity. 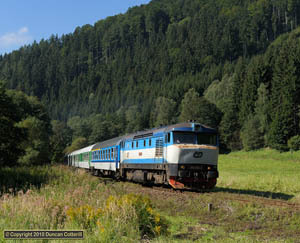 A longer trip to the Czech Republic to photograph diesel workings in some of the country's most scenic areas. 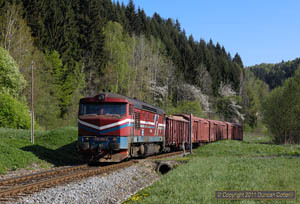 This trip covered three very different operations starting with the class 753 hauled freights in the Liberec area, moving on to the single track secondary route from Nachod to Mezimesti, with its class 714 and 742 worked local passengers, before finishing with class 754 hauled passengers on the double track line from Brno to Veseli nad Moravou. 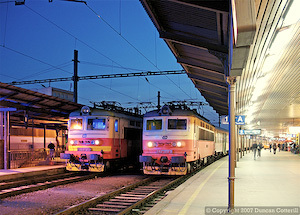 By April it was time to return to the Czech Republic for some diesels and electrics. As a gentle reintroduction to the country, I started off with a visit to the hills around Tisnov, west of Brno, an area I'd explored in poor weather last summer. 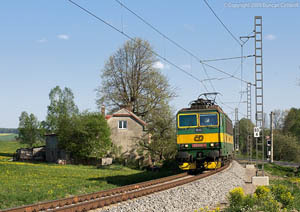 Time was split between the diesel worked secondary line to Zdar nad Sazavou and the electrified main line. Pictures from my July 2004 trip to the Czech Republic have been added to the photo galleries. Pictures from my April 2004 trip to the Czech Republic have been added to the photo galleries.